Although Christmas is coming upon me at a much faster rate than I am prepared for, I am actually in the spirit. It's tough in Florida where there are no environmental indicators (except when one walks into a craft store). Heck, I still haven't taken down the Halloween decorations yet. But I've had a lot on my plate getting ready for my big annual holiday workshop this Sunday. Literally been at it since August. I'm very excited for it to finally be here! I knew when Tim first showed us these new lanterns that I was going to HAVE to make something with them. They are part of his Idea-ology line and they come with a battery pack which holds two AA batteries per lantern. Each lanterns has a generous length of cord, so I was able to weave it through the window and put the battery pack inside the house. The top of the house comes off like a lid, so all I have to do is pull it off to plug in the battery pack when I'm ready to light up the house. 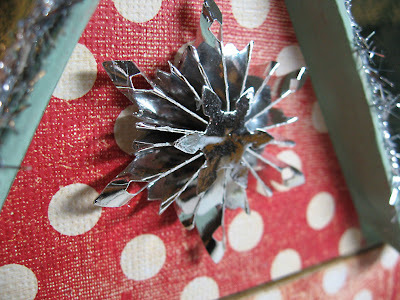 I just got this fantastic rosette die called Mini Snowflake Rosette, by Sizzix Alternations. I cut metallic silver paper to make two of these snowflakes for the top of the house. The tinsel trim on the top of the roof line is also from Idea-ology called Tinsel Twine. The wreath is another new Sizzix Alterations die called Mini Wreath & Bow. I cut it from Kraft-Core cardstock, then embossed it with my Sizzix Raspberry Frame Set embossing folder for a textured background. I sanded it a bit, then added Xmas Red Stickles. 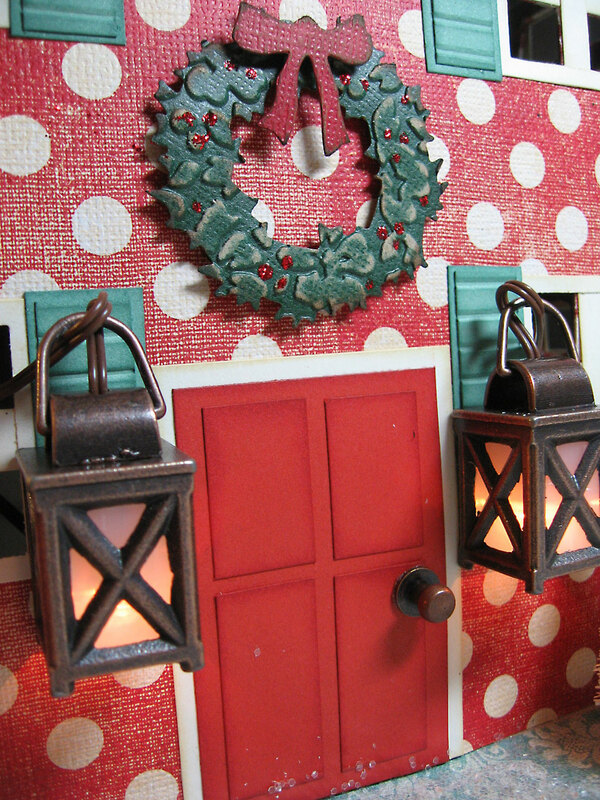 My front door is simply card stock pieces inked and layered, and for the doorknob I used a hitch fastener. The door doesn't actually open. Just for show. 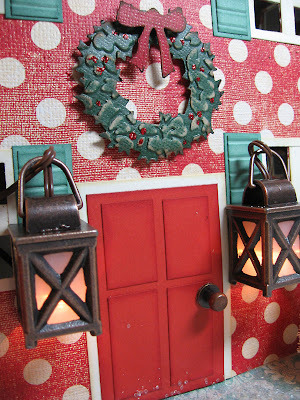 And of course, those mini lanterns flank the door. I glued them right to the house with Beacon's 3-in-1 Glue. 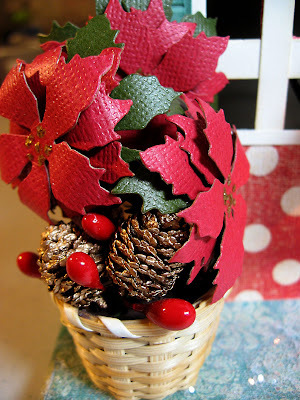 My little poinsettia pot is filled with some craft store mini pine cones and berries. The poinsettias and leaves are from the new Sizzix Alterations die called Mini Cardinal & Poinsettia. I cut three out of red Kraft-Core card stock and layered them up with a small foam square between each layer. Then I cut one more out of green Kraft-Core for the leaves. Each cluster has been glued to a toothpick which I covered with green floral tape and then all stems are stuck into clay inside the mini basket. The windows took the most time do to because there are a total of 12 of them and each one needed a pane and shutters. This made the windows look so much more finished. I used the Sizzix Textured Fade called Collage & Notebook on Juniper card stock to make the shutter effect. Then I layered that piece onto another piece of Juniper. Sort of looks like a shutter, don't you think? The trees on the right are from the Idea-ology pack called Woodlands. It comes with a small wreath as well, but I'm saving that for one of the smaller houses I bought. 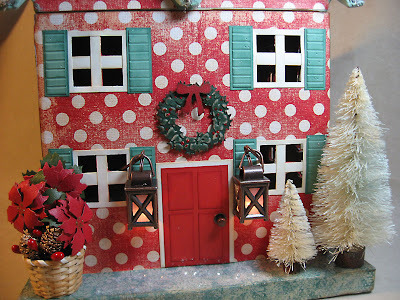 (Yes, I'm going to make a little Christmas village and will post when it's finished.) I liked the cream color of the trees with my house but wanted to give them just a little shimmer, so I lightly spritzed them with some Krylon Glitter Blast "Sparkling Waters" glitter spray from the local craft store. A dusting of regular white glitter all over for the snow finished off the house perfectly. 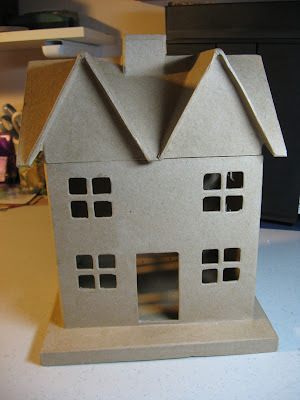 Each of my class members' houses will look different since we'll be using one paper pack to choose from. I used Hobby Lobby's Paper Studio pack called Old World Winter. It has that vintage look and provides three sheets of each pattern in the pack. The perfect amount to cover the main house portion. And just in case you wondered, the house is 12 inches high and 9 inches wide. I'll be sure to post a photo of the group's houses when they are finished. We meet next Friday, November 16th, so stay tuned! Wow ! You did a wonderful job on this one. It is very good. You used every die so well. This is absolutely GORGEOUS & I love what you've done. I just might have to dive in to do one of these for the holidays to put up in my home. Can't even imagine being able to do something like this! Great job! Really great job. I want to live by you so I can join your club. The lanterns look almost identical to the one's I have on my back patio. Love this happy Christmas house. Thanks to all. To answer Amy's question, it took me a full day to design it. At least 8 hours. You know it always takes a lot longer to design because of planning, trying, playing with ideas. But the class will probably take 4 hours. It's a bigger project than usual but the club is really flexible. We order in lunch and stay as long as needed. This is incredible, Annette!! Love it! This is amazing!! Love all the thought and details you put into it! That is really wonderful! I can't wait to see a whole village of them. Wow, this is an awesome piece and I love all the elements. What a great house. 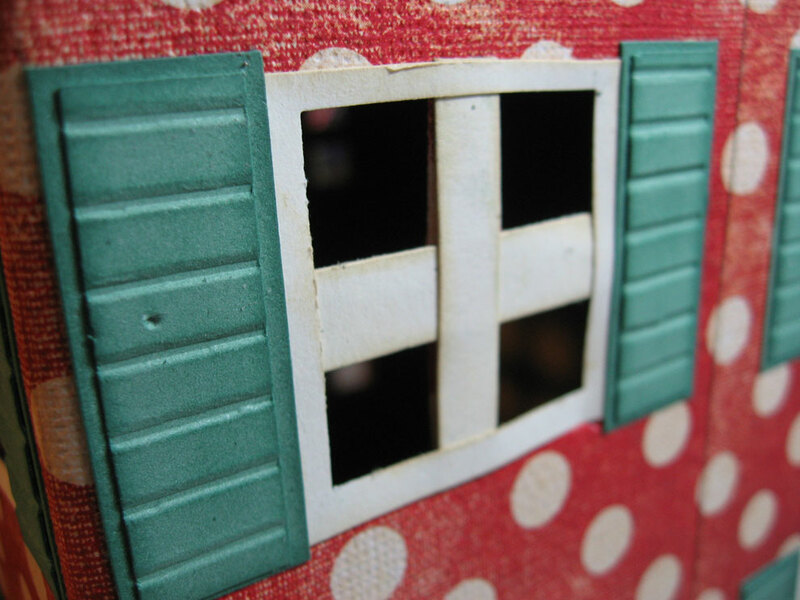 The papier mache house is just the sort of thing I'm always looking for but never find. Lucky you. Don't have Hobby Lobby where I am and Michael's never has anything like that. You did a great job with it and I look forward to seeing the rest of your village. OMG your house is adorbs, Annette! I have two of Tim's mini lanterns waiting for me to create something. I just love what you have done to the place! Looks great! Awesome! Stunning! BTW, love your name too!! This is just wonderful! D you need a roomie! SO impressed by this house! Looks amazing, and those lamps are fantastic! absolutely beautiful!! You did a great job!! Stunning! You have created a masterpiece. I can't wait to see more! Wow! Absolutely gorgeous! Be proud, what a piece of wonderful work! Oh my goodness! This little house is amazing. I love the details, especially the lights! I can't wait to see the "village". Oh, Annette, your house is fabulous! Love how you used the snowflakes and especially the mini lanterns. Wonderful! I am crazy about little houses, and this one is awesome! Glad to know I can find some made of papier mache! I wouldn't have wanted to construct one from scratch. This is tremendous. I absolutely love it!! You are way to creative and talented! I wish I was you!!!! I really love it! I looked at the unfinished one and then the one you embellished and it's like day and night! So crafty, so imaginative, love it! This is fabulous! Your attention to detail is fantastic! Congrats on the shout-out from Tim in his Dec blogworthy post! What a beautiful project! 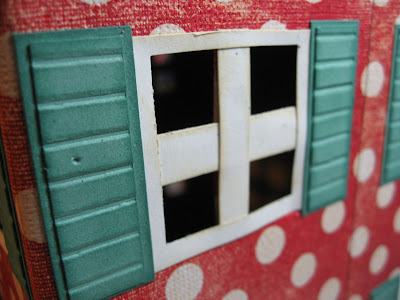 Congrats on the Tim Holtz Blogworthy Link mention! Well deserved! So delighted to end up here from Tim's Blogworthy links posting. Wow! What a fun holiday house project. LOVE how you incorporated those lanterns!! You really did a beautiful job--especially using all the Sizzix dies too! Really great! How fun to see all you did with this house. I enjoyed your photos etc. Thanks for sharing. Great job!!! This turned out fantastic!! 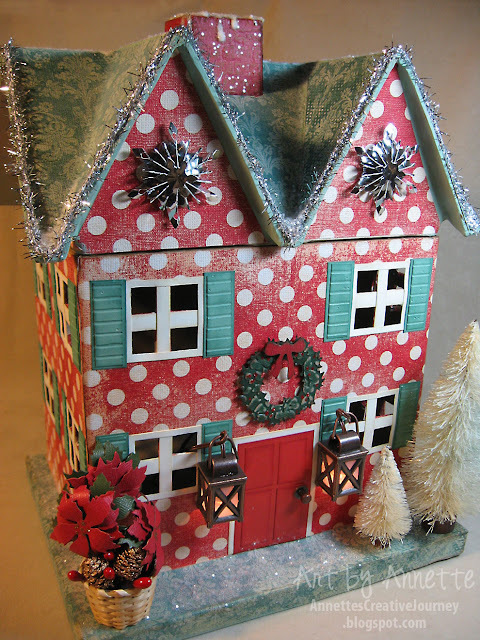 Fantastic to see you on the TH Blogworthy Links - what a fabulous Chirstmas house!! Gorgeous! 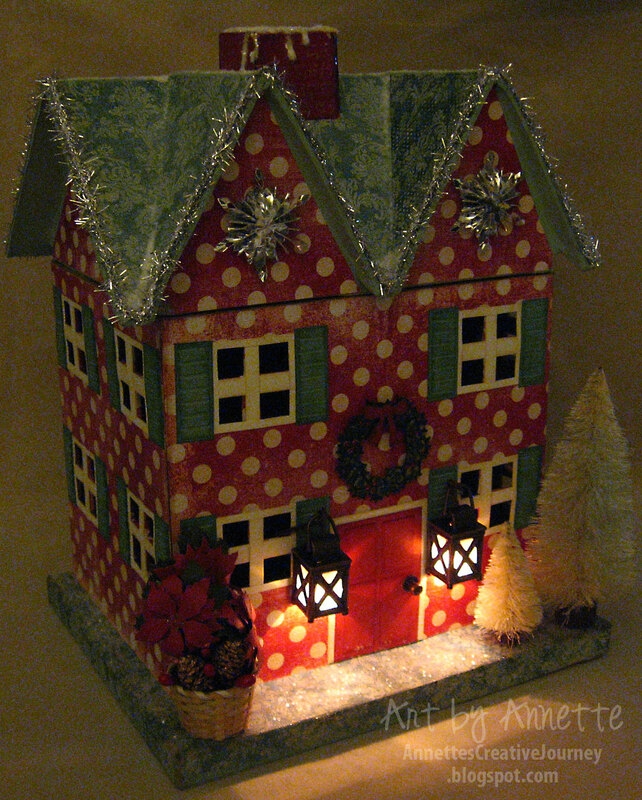 Love the lantern use...fabulous! Congrats on the shout out...so worthy!!! Annette's blog just got highlighted by Tim Holtz himself...check it out! Oh my gosh, this house is awesome! What great creativity! Congrats for joining me on Tim's blog today! Wow, this is amazing! Congrats on the shout out from Tim! Your house is gorgeous!!! Those laterns are perfect! This house is outstanding! I love it and you can use it over again for decorating. Thanks for sharing it with us! This little house is so cozy that I wish I could live in it. your work is fantastic and so colorful and full of joy. Love it Love it. Wow this little house is so cozy and cute I wish I could live in it myself. Love all the colors and plants and the little lamps in the front are so adorable when it's dark and all lit up..Love it Love it. Wow...I can't put into words how great this is! 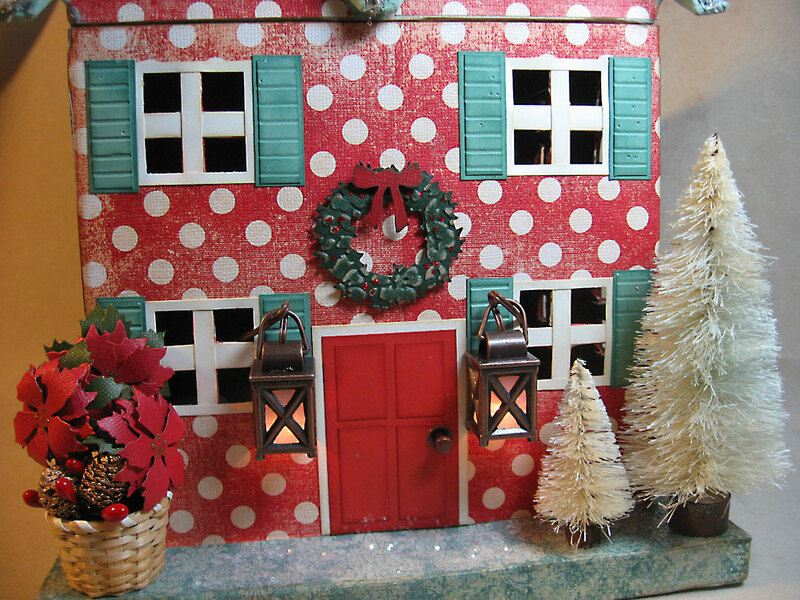 All the fun details...Love the trees, the doors and shutters, all of it... Wow! You are right! Those mini lanterns ROCK! I love your house. Congratulations on making Tim's list. Your house is beautiful. You did a great job, and I love all the little, and big, details. Thanks so much. Love, love this. Congrats on being on Tim's list. You most definitely deserve to be. Now going to check your follow up post. OMG!! TIM HOLTZ linked your blog! You've reached the big time! Congrats!! Nice job! This is fabulous!